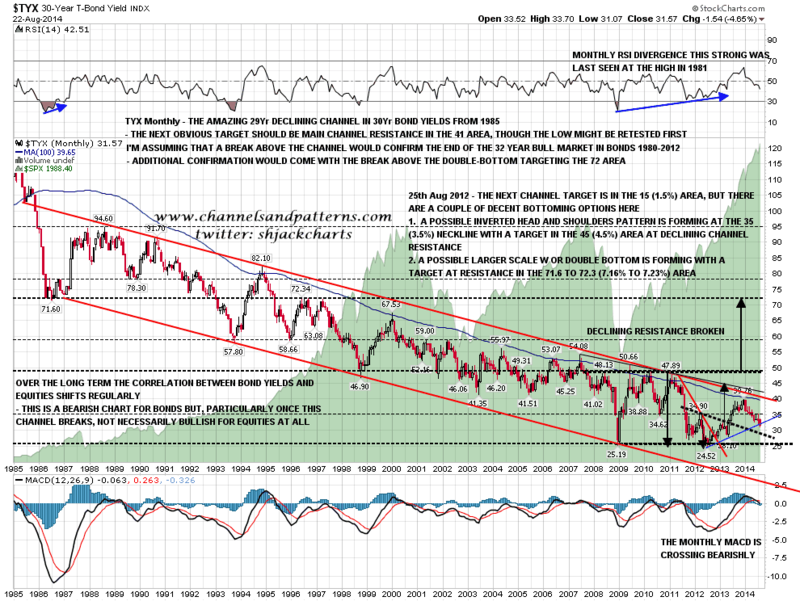 Channels and Patterns: US Dollar - Infinity and Beyond? At the end of the two previous QE periods there have been three strong trends that have emerged each time. 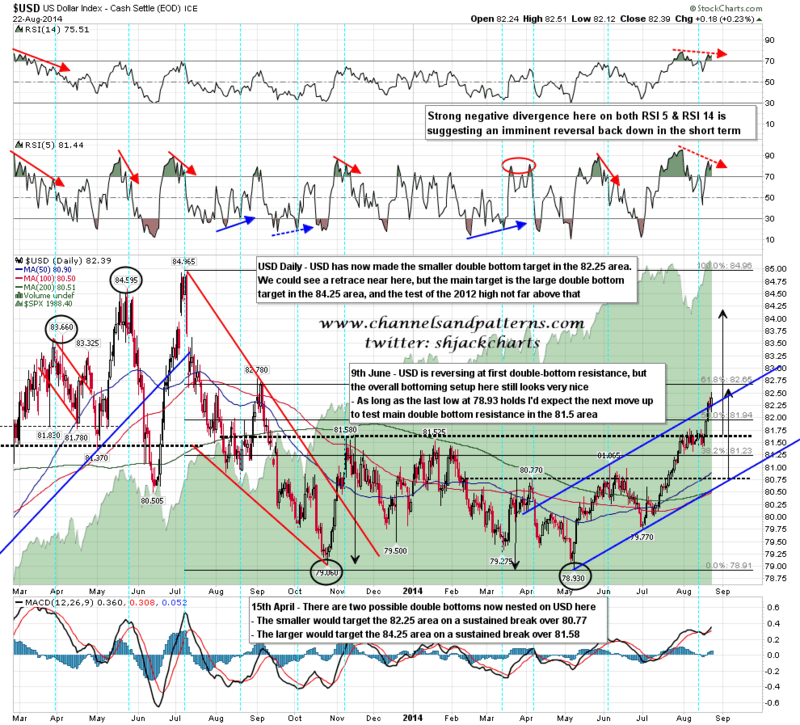 The first two are a significant pullback in equities and a strong rally on bonds. We may be approaching a significant high on equities soon, and I have a setup for a major further rally in bonds, though that may well only trigger if we see that strong pullback on equities. The third is a strong rally on USD, and it's that I would like to talk about today. USD has advanced strongly since hitting 78.93 in May, and I want to show where that is likely to lead over the next few months, and where it might then go over the next few years. I'll start with EURUSD, which is very important to USD because the Euro makes up an impressive 57.6% of the USD index. EURUSD broke down from the rising wedge from the 2012 low in July, and at the same level broke below the neckline of an H&S targeting the 1.30 area, which would be close to a 50% retracement of the move up from the 2012 low. What could possibly prompt a doubling of USD from the current level? Well firstly I'd say that it may not happen, even if the long secular USD bear market resistance trendline at 86/7 breaks up. 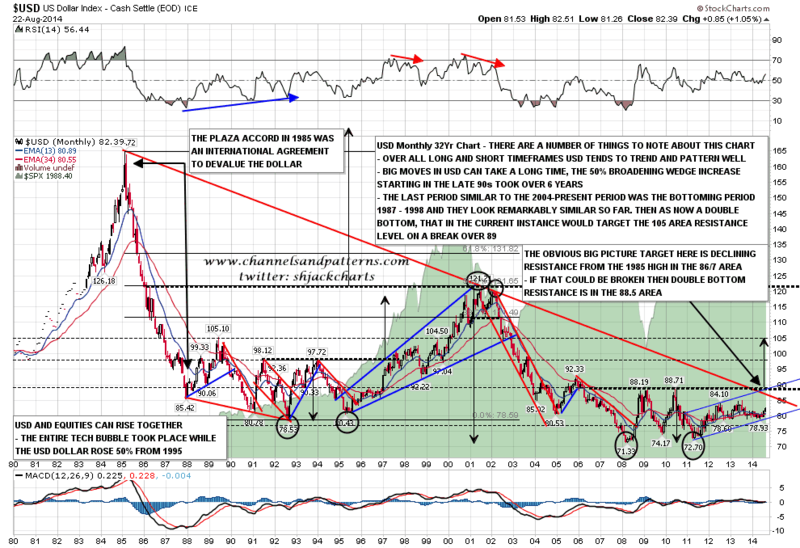 There is a path back to the 1985 here, but USD may not take that path. However it isn't that hard to see what might prompt such a huge move. The first reason might be extreme relative weakness in major USD index components. EURUSD (57.6% of the USD index) had a crisis a couple of years ago and is in a very long depression, with Euro-zone GDP still significantly short of the 2008 level. It isn't that hard to see current policies ending in a much larger crisis that could depress EURUSD well below 2012 levels. JPYUSD (11.9% of the USD index) is the currency of a country in a multi-decade depression, with levels of government debt so high (250%+ of GDP?) that default is really a matter of when rather than if. I called JPYUSD short on 14th November 2012, you can see that post here, and I'd note that the full rising wedge target is a retracement to the 2007 low at 80.55, with JPYUSD currently at 96. From a long terms fundamentals perspective I think that Yen might be an interesting long if it was to reach the 1982 low at 36.04, but I'd have to see a promising setup there, particularly if Japan had not yet defaulted. So 69.5% of the USD index is made up of two currencies that may go into death spirals due to economic depression and future government default. What else is there? Well there is also the long term chart on bonds of course, and the implications from that are well worth considering here. I last posted this TYX (30yr bond yields) chart a year or so ago I think, with this amazing 29 year falling channel on 30yr bond yields. TYX is at an inflection point right now, and may retest the lows before we see the move to test channel resistance, but if that channel should then break up in a year or two, breaking the downtrend from the 1980 high, then a further break over the 48-50 resistance level would trigger a double bottom target in the 72 to 77 area. If the two major components of the USD index were at that point still stuck in depressions with ultra-low interest rates, that could make the US Dollar extremely attractive relatively, and fuel a huge move there. So what's the takeaway here? Well USD and EURUSD may just be starting big moves that may last several years, and USD looks like a buy on any decent dips. I'll be watching these and posting regular updates. 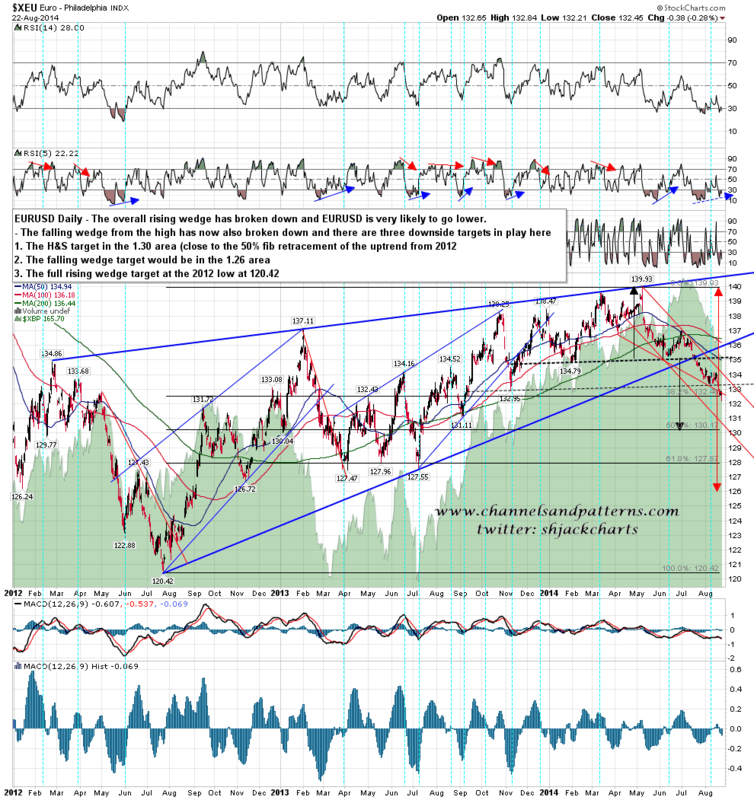 The other takeaway is that if we see the big further rally on bonds that I was looking at in the TLT projection I posted on 28th July, you can see that chart here, then when that rally ends it may be the start of a huge decline on bonds (and rise in bond yields) that may play out over decades. I'll be watching for that entry point, and when we see that it may well make my short call on Yen in November 2012 look like relatively small potatoes.